Hailey Bachrach writes on the Menier’s wintry new staging of a musical that’s “by and for the kinds of Jews who want something to celebrate at Christmastime”. Is there some irony in programming Fiddler on the Roof in the slot that would, in any other theatre in London, be the Christmas show? Well, it was the fifth night of Hanukkah when I saw it. And to be honest, if it is ironic, it’s also perfect, because Fiddler on the Roof is by and for the kinds of Jews who want something to celebrate at Christmastime, the very ones who turned the little-known Talmudic festival of Hanukkah into probably the most well-known Jewish holiday. In fact, Fiddler on the Roof came out the very year that Caroline, or Change, now on the West End, is set, where the characters cheerfully note that they celebrate Hanukkah ‘even though / It isn’t in the Torah… Who cares what all the sages say? / We celebrate it anyway… Especially in America.’ Alisa Solomon’s terrific book Wonder of Wonders describes how Fiddler on the Roof became iconic for precisely this kind of relatively secular American Jew, creating a sort of shared fictional past for a generation who felt, between the Holocaust and the post-war push for assimilation, they had lost track of their heritage. I mention all this because it’s essential to understanding how Fiddler on the Roof works. Despite the relatively successful aesthetic of the 1971 film adaptation, it is not actually a gritty, authentic tale of life in the Pale of Settlement. It’s an origin myth, with all the elements of whimsy and fantasy that such stories contain. The hint is in the director of the original production: Jerome Robbins, probably most famous for choreographing West Side Story. His role in the musical’s creation (which was profound, and why he continues to be credited in programs, as in this production) is a reminder that its heightened lyricism has much deeper roots than just the presence of songs. It’s the story of Tevye the Milkman, whose three daughters—unbeknownst to everyone, including themselves—are actually already Americans. They love and respect their religion and culture, just… not so much that they want their lives to be guided by it. The show depicts their increasingly radical departures from expectation through the marriages they undertake, all as the shadow of anti-Semitic state repression and violence hangs ever more heavily over the village. It’s a musical! And it’s definitely a Jewish musical. Its unmistakable Borscht Belt rhythms are like the hairy cousin of Britain’s brassy panto beats—related, but really not the same—and they just elude director Trevor Nunn. Oddly, for a man best known for directing musicals, he clings unrelentingly to a staid realism that doesn’t serve the show particularly well (and which includes a notable lack of diversity in the cast, something he has come under fire for before). The Menier Chocolate Factory stage is all panelled in wood, with a row of little Christmas fair huts and every necessary set piece constructed out of crates and planks. Everyone wears black. Most egregiously, though, the production’s literalism takes the form of largely uninspired choreography, to the point of cutting a key second-act dance sequence entirely. Occasionally, the group numbers are allowed to lift off the way they should—the bottle dance is a notable example, but then again, that choreography is pure Robbins—but more often they just feel just a touch too flat and slow. That said, it would take more than an excess of literalism to collapse such a well-constructed musical. Nunn does make some splendid choices, particularly regarding casting: the daughters are achingly young, flitting across the stage and creating a beautiful sense of lives lived just out of their parents’ sight. Their three main sisters’ love stories can seem underwritten; for the first time, I felt it was just that I was seeing them though Tevye’s eyes, as startled as he was to realize that his girls were suddenly women with experiences and thoughts and feelings he’d known nothing of. The first two pairs manage to wrest fully-drawn characters out of these glimpses, though it’s an unfortunate fact that the boys get the best bits: Stewart Clarke’s twitchy, leather-clad radical Perchick’s self-conscious outbursts, or when Joshua Gannon’s cringing young tailor Motel finally stands up tall and bursts into glorious song. Andy Nyman and Judy Kuhn amply fill up the heart of the show, as they must. Kuhn’s brittle Golde is so vivid you almost don’t notice how under-used she is. Her too-infrequent songs are some of the best, however, especially her and Nyman’s second act duet of tentative, belated love. Nyman’s Tevye is warm, funny, and deeply feeling. He feels marked above all by his compassion—for the local constable, for the butcher he always hated, for the odd young student who wants to teach children and change the world, for his daughters and their happiness. It makes the final vignette, the final marriage, all the more devastating. Even his chats with the Almighty, his prayer in the form of sarcastic heart-to-hearts, are because he can conceive of no other form for such an intimate relationship than frank friendship. Stepping into a room of watching strangers, all he wants to do is greet us, make us feel welcome, make sure we understand. And Tevye’s relationship with the audience is, in large part, what makes the musical work so well. He’s the bridge between the lost past and now, nudging us out of voyeurism into humour and empathy. Much as Nunn strives for a sense of immersion in the shtetl, the show’s big, weird heart pushes back. 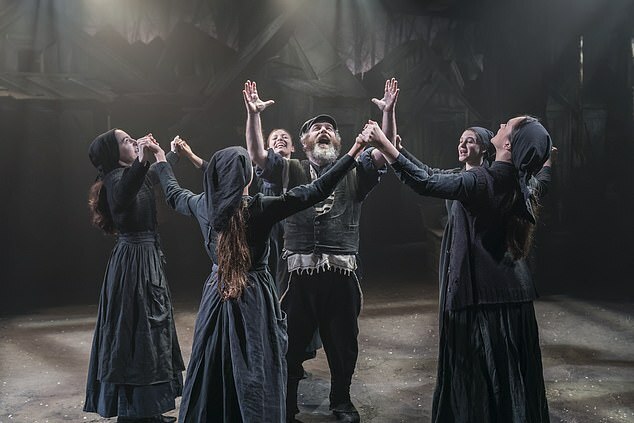 Fiddler on the Roof is on at Menier Chocolate Factory until 9th March 2019. More info and tickets here.